Vu has launched its first Android TV range in India. TV's come in 43-inch (43SU128), 49-inch (49SU131) and 55-inch (55SU134) sizes and have 4K UHD resolution. These come with Vu ActiVoice built into the remote for voice search, browse and select in 88 languages and also comes with a standard remote. The company is calling it official Android TV since other unofficial TVs don’t come with voice search. The company has partnered with Netflix, Hotstar, and ALTBalaji to offer certified VOD apps. You can also install apps and games from the Google Play Store. All the models have built-in 10+10 Watt Box Speaker in the form of Soundbar. The TV has both Dolby Digital and DTS support. Even though these TVs run Android 7.0 (Nougat), it will be upgraded to Android 8.0 (Oreo) sometime in the second half of 2018. These have Chromecast support to cast content from Android, iOS, Mac, Windows and Chromebook to the TV. 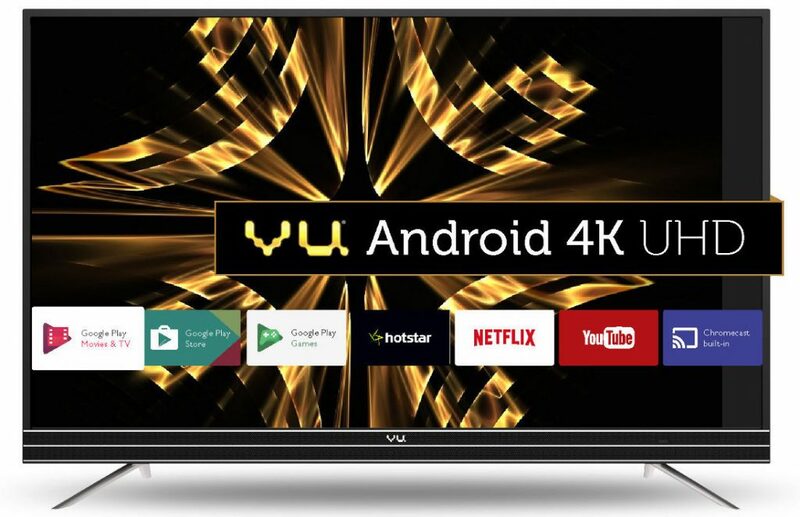 Vu Android 4K UHD 43-inch, 49-inch, and 55-inch TVs are priced at Rs. 36,999, Rs. 46,999 and Rs. 55,999, respectively and will be available exclusively through Flipkart as well as Vu’s flagship stores starting March 16th.